Ever since her first solo exhibition “Lady Painting” in 2017, meticulous figure painter Wang Yi-Ping has captured the attention of scholars and contemporary ink art collectors, for her detail oriented techniques can be traced back to the traditional methods used by renowned artists from China and Taiwan. As Professor Chou Fan-Mei from the Institute of Art Studies, National Central University points out, Wang has taken inspiration from Giuseppe Castiglione and Chen Chin, combining western trainings in drawing and Chinese painterly compositions into her works. The detailed backgrounds refer to the style of living and fashion of the times which the paintings are set in, the sense of nostalgia and solitude make the works stand out in the hustle bustle of contemporary life. The highly anticipated exhibition “Graciousness‧Belle Demoiselle” brings nearly twenty new works produced in the past two years by Wang Yi-Ping, whose life circles around her paintings. Wang sees painting as a way of recording of the pass of time, and the documentation of her own life. Her maturity in the techniques are clearly visible in her most recent works, and each stroke and each line can be seen as a record of the artist’s feelings toward life. 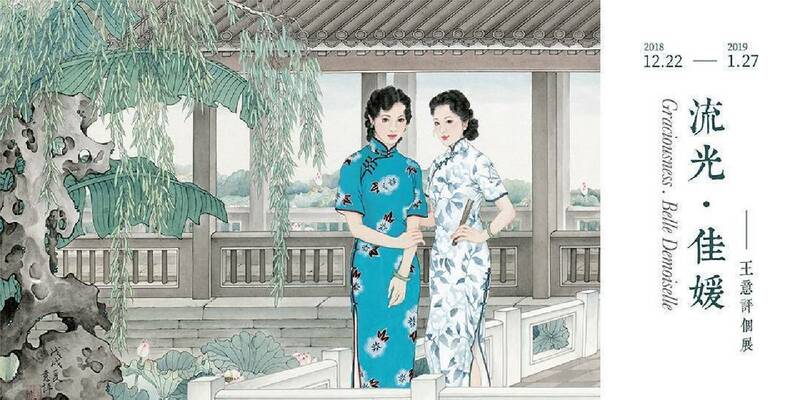 Wang Yi-Ping has always shown an interest in traditional Chinese and eastern style fashion, and such enthusiasm is even visible to those are not familiar with traditional Chinese culture. Its elegance can easily be sensed at first glance, and the paintings certainly deserve long term appreciation. We live in a time of capitalism and consumer culture, where aesthetics is strongly affected by the splendour of new media, and the simplicity of a quiet and undisturbed life is no longer available to us. Wang Yi-Ping invites the viewers to the tranquility of her painted world, where one could enjoy the sereneness and calmness that lacks in reality. Wang’s application of conventional Chinese calligraphy and painting techniques in her paintings also indicate her ability in the portrayal of classical beauties and her sensible aesthetics in the creation of atmospheric compositions. These merits inspire the spectators to appreciate the picturesqueness of Chinese art. Celebrated for her elegant female figure paintings, Wang Yi-Ping continues to combine classical elements with contemporary aesthetics. We would like to invite you to the opening reception of Yi-Ping’s solo exhibition “Graciousness‧Belle Demoiselle” in Daguan Gallery at 3pm on Saturday 22 December 2018, where you shall be greeted by her gracious paintings.